Flotron’s off-the-shelf mounting plate and angle mount interface options are simple and functional for most of our customers’ applications. However, Flotron has supported many of our customers’ needs for custom interface solutions and custom payload interfaces. Often times our customers will provide us with simplified 3D models of their payload or a conceptual drawing of their interface that will help us in our design process. This information can be shared via email, CD, or through an approved third party data sharing service. The 61700 is designed to support a complex geometry payload. 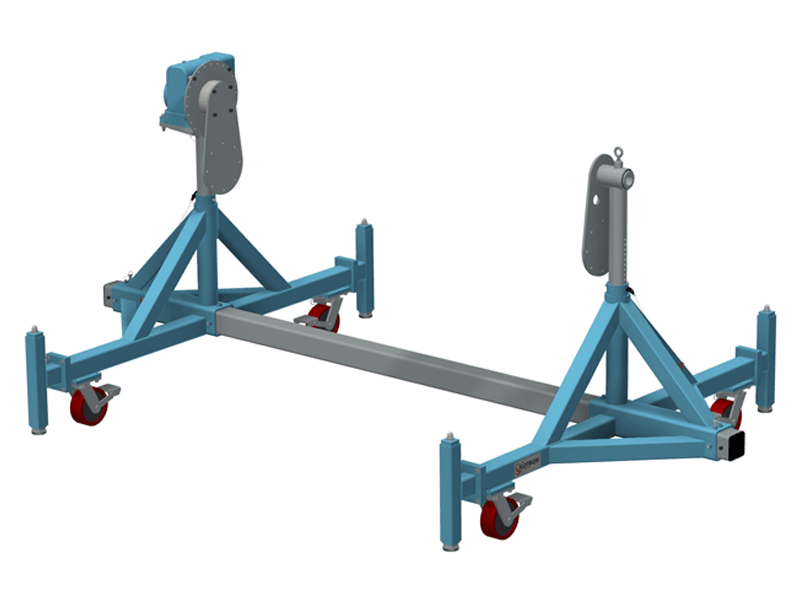 The Rotational Holding Fixture has the footprint of an off-the-shelf Flotron Model XD747 with twice the load capacity. The load rating of this fixture was doubled by increasing end frame component cross sections and wall thicknesses in addition to incorporating Flotron’s 800 series hardware and coupling system. Flotron also designed and manufactured the precision tooling that supports the payload. A stainless steel base plate mounts between the fixture interfaces. This heat treated base plate was water-jet cut to match payload geometry and then machined. A set of precision machined brackets mount to the top face of the base plate and a set of precision machined tooling pins interface the payload through these brackets. Two of the bracket assemblies incorporate spherical bearings that are used to assist with angular alignment. The 45000 is a custom rotational holding fixture that utilizes a gearbox similar in size to that used on our 900 series fixtures. The fixture is designed to support a curved wing skin in a large perimeter frame that was also designed and manufactured by Flotron. 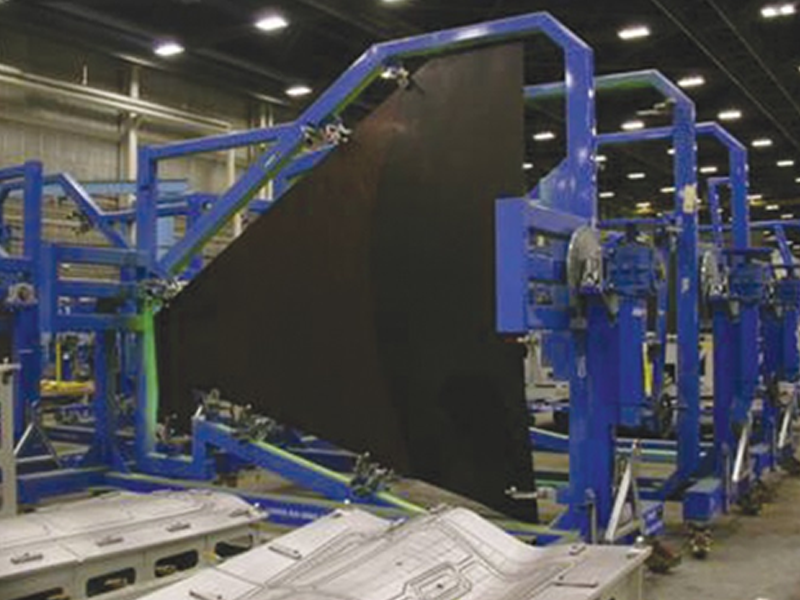 Precision mounting of the wing skin to the perimeter frame at the correct angle and true position was accomplished by utilizing a CMM during the welding process and during assembly by incorporating custom designed interface clamps. Precision adjustment capability allows the customer to perform multiple operations at different stations without changing fixtures. This unit is designed to be similar to the 800 series while meeting custom specifications. It retains the low backlash, stair step resistant gearbox design of the 800 series as well as its stiff high load capacity frame. However, the frame is highly modified in order to meet the customer's requirements. It also includes a special mount for holding and counter balancing the customer's load. 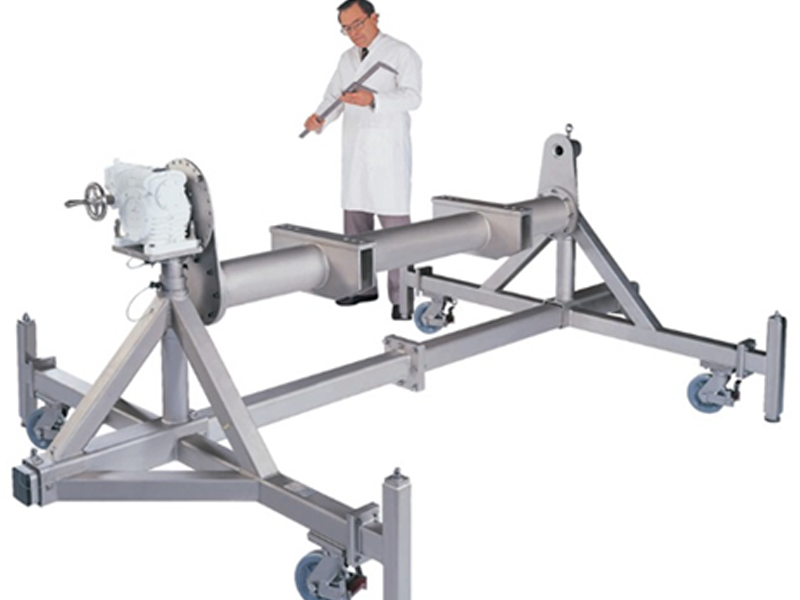 The unit is supplied with the clean room option that includes electroless nickel plating on all steel parts, stainless steel hardware, including the caster frames, and high gloss epoxy white paint on the gearbox housing. 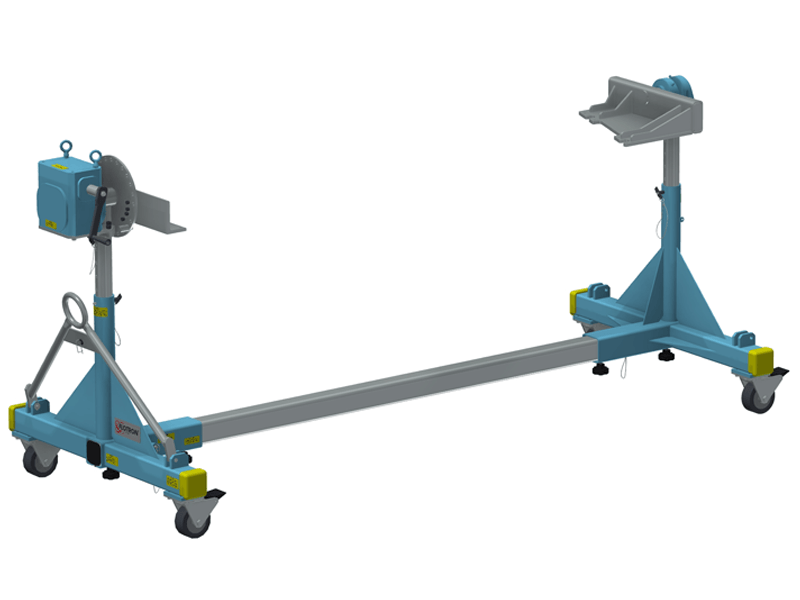 Rotation fixture with 1G lateral stability and leveling jacks to level the fixture on uneven terrain. The payload CG is positioned over rotation centerline with tear drop interface hardware. 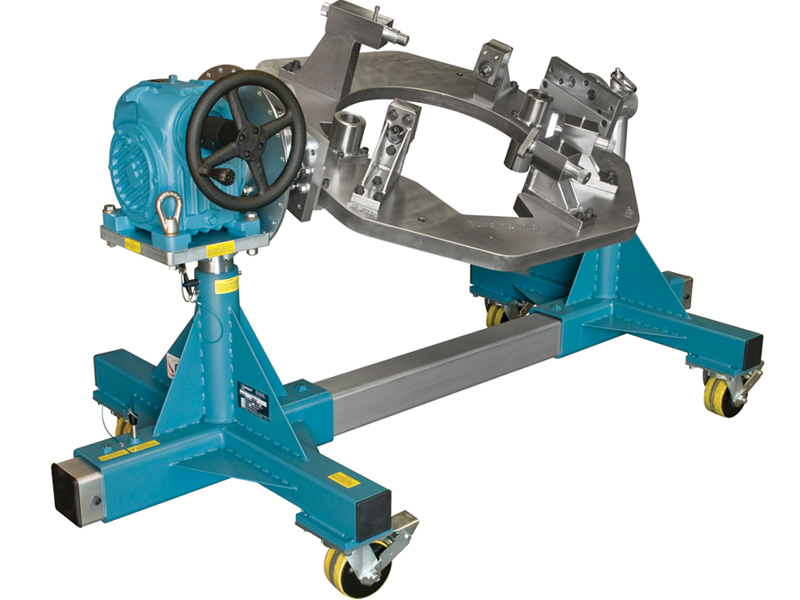 Assembly fixture with custom payload interface and dual pillow block non-gearbox side bearings designed to support the high moment load of the payload interface frame during processing.